The Protect All brand highlights a history of dependable, customer-focused products, enabling long-term savings for the end user. Advanced formula Protect All with UV Blocker is an extremely effective cleaner, polish, wax, treatment and protectant for all types of vehicles and surfaces. The application is as quick and easy as wipe on, wipe dry and it requires no tedious detailing around lettering and rubber molding. Superior quality carnauba wax creates and maintains a durable and lustrous showroom shine. 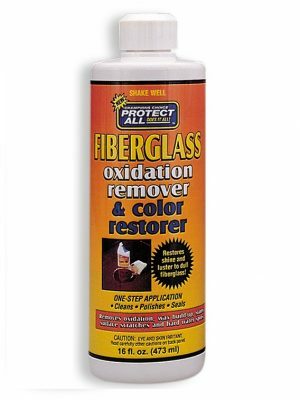 This versatile and economical product is perfect for the do-it-yourselfer or professional detailer to beautify and protect clear-coats, paint, aluminum, fiberglass, gelcoats, chrome, stainless steel, glass, vinyl, rubber, plastic and more. 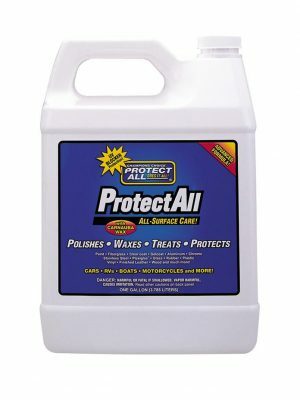 Protect All really does do it all! Now you can get a superior wash and shine without soapy or harsh detergents with Protect All Quick & Easy Wash. Quick & Easy Wash leaves no streaks or spots. With one ounce of Quick & Easy Wash and only one gallon of water you can now wash any vehicle, anywhere it is parked. No rinsing means no mess and it can save hundreds of gallons of water. 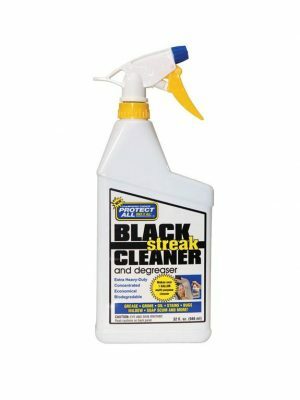 Protect All Extra Heavy-Duty Black Streak Cleaner and Degreaser is a concentrated commercial strength cleaning agent. This biodegradable cleaner can be used straight for the toughest jobs or diluted to provide just the right cleaning power for the job at only pennies per ounce. 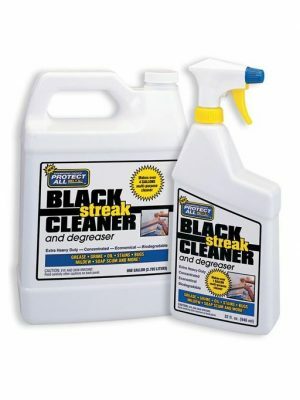 Cleaning and protecting the EPDM rubber roof membrane on your RV no longer has to be a backbreaking and messy chore. 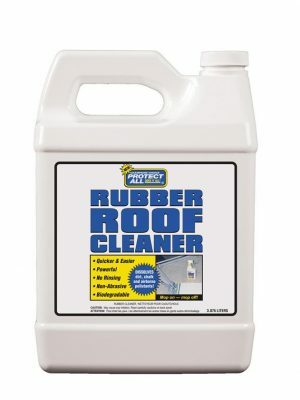 With a sponge mop and bucket of water, Protect All Rubber Roof Cleaner quickly dissolves dirt and the chalky roof residue that cause ugly gray streaks. No hose and no rinsing also means the remainder of the RV stays clean and dry reducing overall maintenance. A quicker and easier stand-up process! 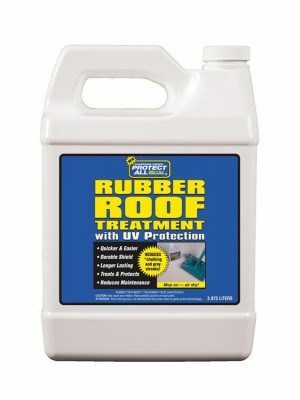 Enhanced Protect All Rubber Roof Treatment with UV Protectant is a blend of proven polyolefin compounds engineered specifically to retard roof chalking, minimize maintenance and provide additional protection that can help extend the life of the rubber roof membrane. The tough polymer anti-static coating creates a durable shield that keeps dirt and grime from sticking. Application of New Rubber Roof Treatment is now quicker and easier — just spray, mop and air dry. The enhanced formula is safe and compatible for use on ALL types of EPDM rubber roof systems. Enhanced Formula Reduces Maintenance Up To 75%! 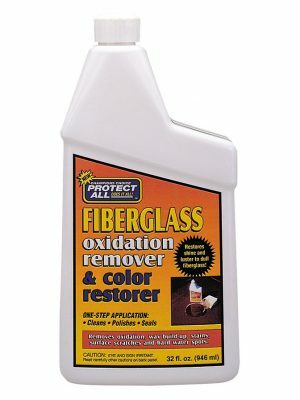 Restore color and luster to dull fiberglass as well as polyurethane and enamel painted metal surfaces with Protect All Fiberglass Oxidation Remover & Color Restorer. This moderately abrasive one-step product cleans oxidation, wax build-up, stains and surface scratches, then polishes the surface to a brilliant shine greatly enhancing the appearance and value of the vehicle. Don’t let rust and corrosion eat away your RV — use…Protect All Heavy-Duty SLIDE-OUT Dry Lube Protectant and Industrial Grade Rust Inhibitor. This superior protectant quickly penetrates between and around parts displacing moisture and preventing rust and corrosion. Wet, oily lubricants and thick greases collect dirt, road grime, sand and salt that gum up the mechanism. 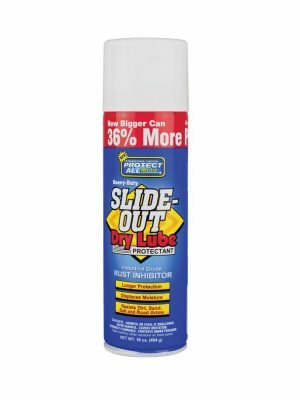 Slide-Out Dry Lube produces a dry, firm, waxy, protective amber colored film that keeps the slide-out mechanism operating like new, clean and rust-free. Daily exposure to the elements, dirt, road grime, air pollutants and the oxidizing effect of the sun’s ultra-violet rays can deteriorate your rubber weather seals prematurely. 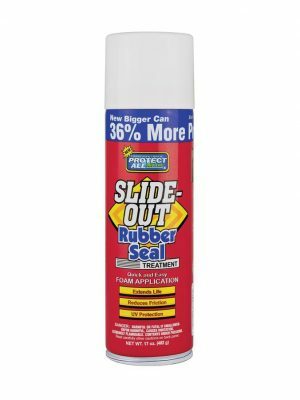 Extend the useful life of all your rubber seals with Slide-Out Rubber Seal Treatment. It produces an anti-static, water repellent, protective film that aids in guarding against premature deterioration while producing a dry, smooth surface that reduces excessive friction and wear. A bead of foam stays where your spray! No runs, drips or mess. 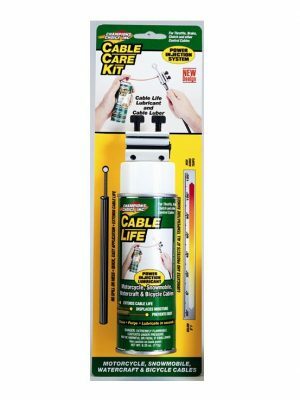 Protect All Cable Life is an excellent cable and general-purpose lubricant ideal for cleaning, lubricating, displacing moisture and preventing rust. As a lubricating agent it continues to be effective from high humid down to subzero temperatures. The Protect All Cable Luber Power Injection Tool is the perfect aid to clean, purge and lubricate throttle, brake, clutch and other control cables quickly, easily and without removing the cable. NEW Improved Design now accepts larger cables up to 3/8 inches in diameter. Two screw clamp for a tighter, more secure fit. 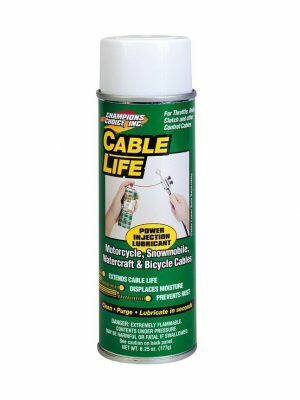 ProtectAll Cable Life is an excellent cable and general-purpose lubricant ideal for cleaning, lubricating, displacing moisture and preventing rust. 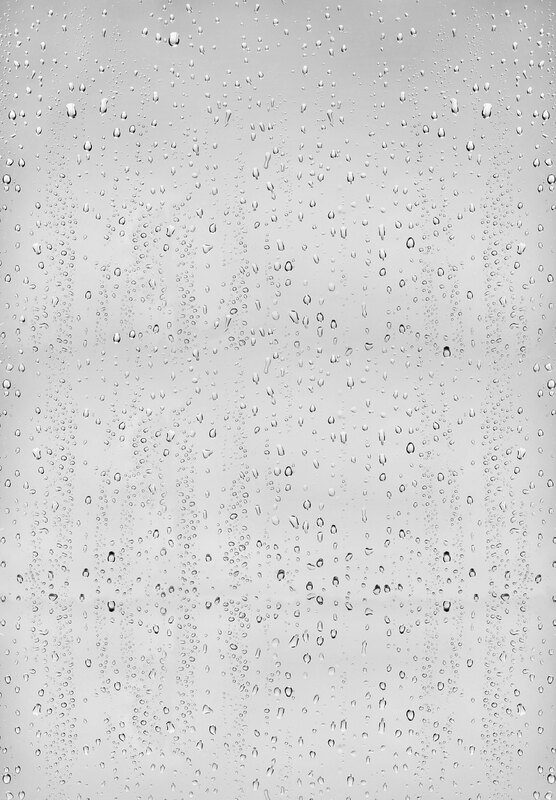 As a lubricating agent, it continues to be effective from high humid down to subzero temperatures. 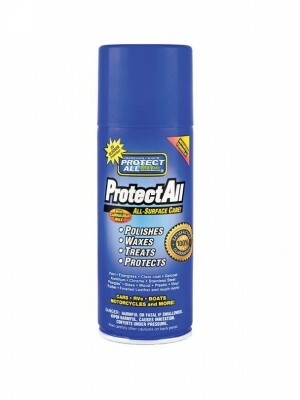 Since 1967, ProtectAll Chain Life has been the industry standard in extreme pressure lubrication. Applied as a thin bead of foam, Chain Life penetrates, clings and silences chains while repelling dirt, sand, mud, and grass. It is an excellent compound for lubrication.